About six months ago, we moved from an apartment on the north side of Beijing near the Asian Games Village to Huamao, or China Central Place. Huamao is in the central business district, in a cluster of massive newish developments like Wanda International, Blue Castle, and Xin Di. and close to somewhat older developments like Sunshine 100 and Soho New Town, now positively venerable by Beijing standards. Popular place to live: I count at least six or so people I'd known previously who live there, including the founder of this company and two ex-colleagues from my days at Red Herring. These are (or were) all upscale residential developments with lots of retail shops and restaurants. My wife Fanfan, being the world's greatest bargainer, managed to get us a spacious four-bedroom apartment for very reasonable rent. At the time we moved in, they had only really finished the residential portion: there were three office towers that abutt Chang'an Avenue to the south, a J.W. Marriott and Ritz Calrton hotel, and a mall of sorts under construction. I was already pretty wild about the amenities in the neighborhood: a great sushi place at Blue Castle, a very solid Peking duck place 3 minutes away on foot, the comfort food offerings of the American Cafe, also at Blue Castle, and--so far--the best French bakery/chocolatier I've had tried in town, called Comptoirs de France, in the very compound we live in. Not a lot of supermarkets in the neighborhood at the time, and that was kind of a pain. There was the Bonjour market in the basement of Sunshine 100, where I'd run into neighbors like former Blue Castle residents Mr. and Mrs. Imagethief from time to time. Problem with Bonjour is that it's too far to carry a real shopping excursion's worth of food home, and too close for a cab ride. A couple of months ago, a Wal-Mart opened at Wanda, and that had everyone in the neighborhood (confessedly, myself included) kind of excited: they offer free delivery of everything within a kilometer, and we were in the radius. Then, yesterday, the mall they'd been building at Huamao--Shin Kong Place (新光天地) finally threw its doors open. After work, Fanfan and I checked it out. We both felt like we were in some sort of strange, consumption-lust-fueled dream. This place is amazing: pretty much every big international brand I can think of in the seven-story monster mall (think Guomao or Oriental Plaza, but more of it, and done up way more nicely). Not like either Fanfan or I are big luxury brand consumers--we still tend to buy clothes at Ya-Show, I'll admit!--but man, this is something you have to see to believe. It's huge. Start with the basement: It's got the best food court I've seen; at least a dozen confectionaries, bakeries, cafes and the like; a place serving up the best hot dogs I've had in China (real NYC-style dogs, Louisiana hot links, and more); and--joy of joys--an awesome supermarket that will give Jenny Lou a run for her money with its selection of imported goods (including, to my delight, at least a half-dozen devent single malt Scotches), plus of course all the usual stuff. All just a minute or two from my door. Atop all the fashion and so forth, there's a floor full of home goodies, which for someone like me who loves kitchen gadgetry is Nirvana. End yuppie scum post. Man, that part of town has changed so much so fast I don't think I could find my way around any more. A friend and former boss used to live in Sunshine 100 and work in Soho back when Blue Castle was but a gleam in the developer's eye.... Well, not quite, but they started digging the foundation for Blue Castle about the time he moved in. I went down the East Fourth Ring the other day and the changes were amazing, especially south of Sihui. I used to know that area, but now the places I recognise are few and far between. "an awesome supermarket that will give Jenny Lou a run for her money with its selection of imported goods"
who can be so stpuid, living in China for long-term and still buy the tourist-fake-garbage at Ya-Show market. Wow, it was pretty shocking and amazing. At one Barnes & Noble store in midtown Manhattan, teen titles are in the lower level, while graphic novels, which Barnes & Noble merchandises as a separate category, are on the second floor. I think you and Fanfan enjoyed the food court of new Shin Kong. 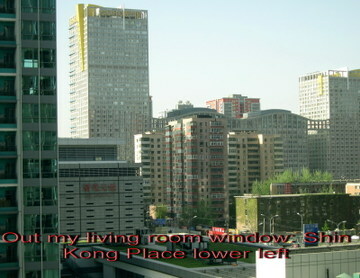 It is really a nice view from your window and according to the article it is too huge and nice place. Samara Beach ... Costa Rica's hidden tropical paradise on the Pacific ocean. It is the perfect, long, white sand beach with shallow, gentle waters. Samara has a superb coral reef and its own picturesque and deserted wooded island in the bay - Isla Chora. It is popular with swimmers and surfers, and it is an ideal beach for your kids.Samara Beach ... Costa Rica's hidden tropical paradise on the Pacific ocean. It is the perfect, long, white sand beach with shallow, gentle waters. Samara has a superb coral reef and its own picturesque and deserted wooded island in the bay - Isla Chora. It is popular with swimmers and surfers, and it is an ideal beach for your kids. Softly sighs the Rainbow,Misty songs of old,Flowing by the skyline.My secret lullaby.Softly sighs the rainbow. How do I file for a real estate tax abatement?